There are many species of snakes and most are not harmful but being able to describe a snake especially during an emergency is important. There are snakes that are poisonous and if bitten can cause you serious harm and in some cases even death. 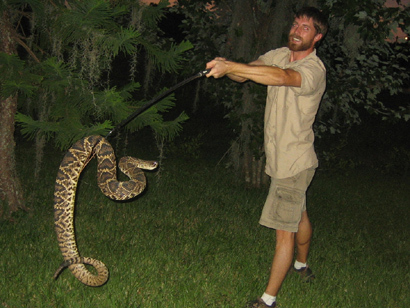 By knowing how to identify a snake that may be in your area, you will know if you need to have it removed. If you or someone close to you is bitten by a snake you will be able to describe the attacker which could be vital in determining an anti-venous serum. Snakes do not bother humans; in fact in most cases they will do their best to avoid you. Snakes are reptiles and come from the Serpentes family which is characterized by having a dry scaly skin and laying hard shell eggs on the land. The Serpentes family also relies on the external environment to keep their body temperature warm. They do not have limbs and are elongated with no ear openings or eyelids. In fact the way to tell the difference between a legless lizard and the snake is that the snake cannot blink and is the only reptile that cannot. General Characteristics Of The Snake - All snakes will shed their skin several times a year including the scales that covers and protects their eyes. They are a carnivorous animal that eat their prey whole by opening their hinged jaw wide and swallowing their victim. Some snakes kill their prey by using venom; others will squeeze their meal until it cannot breathe any longer. Snakes have a two prong tongue that they use to smell. The tongue will pick up scents which are then inserted into the snakes Jacobson organ which is located in the top of their mouth. They use this technique to find their prey and avoid danger. There tongue is not harmful, but the fangs within the mouth carry a venomous liquid that can be deadly. By Its Color or Skin - Just do a web search for a snake of the color you found, in your state, and you might be able to identify it. It's very challenging to identify a snake by its shed skin. The best bet is actually the size of the skin, if it is very large, then that narrows down the possibilities. The Length And Body Shape Of A Snake - Adult snakes will be anywhere from eight inches to six feet long, depending on the species. The babies will be from three inches to eight inches long. Most snakes will not allow you to measure them so it will be an estimated guess. When you are determining the size of a snake it is best to compare it to some object that is nearby. Nineteen to thirty-six inches are considered to be a medium sized snake so anything below or above this measurement will determine whether it is large or small. The body shape is either slim or stout but this may be deceiving as snakes will swallow their prey and their bodies will look like lumps instead of the smooth surface they normally have. The Head And Eye Shapes Of A Snake - This is the area where people will try and determine whether a snake is venomous or not. It is not always accurate though. It is thought that the arrowhead shaped head is an indication that the snake is poisonous, but most snakes that are in defensive mode will flatten their head which gives the appearance of an arrowhead. Another example is the eyes and it is said that if a snake has a cat like or vertical pupil it is venomous and the round pupils indicate non-venomous snakes. The deadly corral snake has round pupils and is very colorful. Patterns can also be deceiving since the patterns are determined by the colors and their shades. If you’re someone who likes to hike or even spend a significant amount of time outdoors it’s a good idea that you consider what species a snake is when you run across it. This will help you know if there is a safety issue. Go back to the main Snake Removal page for more information about How To Identify A Snake By Its Color or Skin.